Cleveland, March 21, 2018…Two thread sealant products from Federal Process Corporation – high-density PTFE tape by Thred Taper™ and EverSeal™ 183 pre-applied liquid thread sealant – are approved for use in propane motor fuel tanks in the U.S. and Canada, after recently earning the LP gas systems certification from Underwriters Laboratories of Canada (ULC). Thred Taper PTFE tape and EverSeal 183 thread sealant now comply with the CAN/ULC-S642 Standard for Compounds and Tapes for Threaded Pipe Joints. The most up-to-date code requirements for propane motor fuel tanks and systems used in the U.S. and Canada specify that thread sealants must comply with the CAN/ULC-S642 standard and withstand pressures of at least 390 PSI (2,689 kPa). The CAN/ULC-S642 standard establishes minimum requirements for determining the acceptability of pipe joint compounds and tapes for piping systems used to contain propane, butane and a range of other gases and liquids. 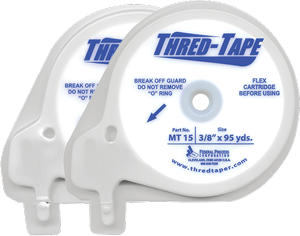 Designed for use with its automatic tape wrapping machine, Thred Taper’s commercial grade, non-toxic PTFE tape offers twice the thickness of standard PTFE tape at 3.5 mils for less wrapping and decreased waste. The tape is available in six colors for six different applications – including yellow for natural gas, propane, butane and oil – and widths of 3/16-inch, 1/4-inch, 3/8-inch and 1/2-inch. It is rated to a maximum pressure range of 700 to 1,900 PSI, depending on application. For more information, visit www.ThredTaper.com. EverSeal 183 is a water-based, non-toxic liquid thread sealant, ideal for methane, natural gas, butane and propane gas systems. The sealant has an operating temperature range of -65°F to 300°F (-54°C to 149°C) and will hold its seal at pressures of up to 10,000 PSI (69,000 kPa) when used in conjunction with 1/2-inch NPT pipe threads. The unique, uncured formula offers a one-year shelf life and can be easily cleaned with soap and water. For more information, visit www.EverSealSealants.com. EverSeal and Thred Taper are brands of the Federal Process Corporation, based in Cleveland, Ohio. Since 1915, Federal Process has leveraged its chemical expertise and experience within key markets to help enhance user productivity. For more information about Federal Process, please visit www.FederalProcess.com or call 1-800-846-7325.